Studying the trees, waterfalls and granite slab history of Yosemite Valley and the Hetch Hetchy. Monoliths forever at attention watch over us all below. 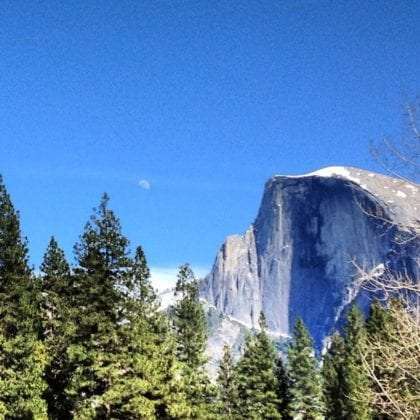 The moon hangs just above one such giant, Half Dome, a thousand foot granite egg sliced in half to reveal millions year old hard boiled lava responsible for creating these astonishing views from nearly any angle in the Yosemite Valley. They’ve seen fires, like the one last year responsible for the burnt orange desolation blanketing the foothills all the way into the park from the Western entrance. Even during the middle of the week, still technically Winter, humans have come from the cities and schools of California, from as far away as Asia, to play in this, the home of naturalist John Muir and everything exalted to grandiose heights. Waterfalls, the aforementioned granite cliffs, Ponderosa Pines and their largest of all tree neighbors, the Giant Sequoias, stretch into the stratosphere. A few miles outside of the park a not quite yet teenage boy wanders around a campground, playing a sort of cat and mouse game that can never be won with a similarly aged young girl, both of them interested in each other’s company but not sure how to break that particular ice. 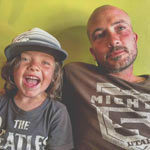 His younger brother learns to ride a bike, his three year old legs learning to lift from the ground as he coasts beneath California Black Oak and dodges the massive speed bumps that are Gray Pine cones and jagged ravines caused by runoff down the camp’s dirt roads in the rainy season. Their even young brother is just getting his footing, learning to walk and frustrated at not being able to touch and hold and be burned by the campfire, uncertain as to what the big deal could be, something so beautiful. Their mama and nanny cook up sloppy joe dinners or fashion turkey sandwiches and yogurt and strawberry lunches. Their father peruses maps of short trails appropriate for their various levels of ability, reading through tree identification books and eager to teach them this new knowledge of such a varied ecosystem. The moon slowly leaves its position above Half Dome, and as the now later nights set after 7:30, Spring promises sunny, warm days. A countdown to Winter begins all over again, and it is at it’s earliest tick on that clock. The fire does down, is extinguished, and all are asleep, save Orion, with his mighty belt and bow, holding the moon in his left and watching down over us all from the southern sky.